England bowlers Mark Wood and Moeen Ali have muted a West Indies reply that was off to a thundering start on day two of the third Test in St Lucia. 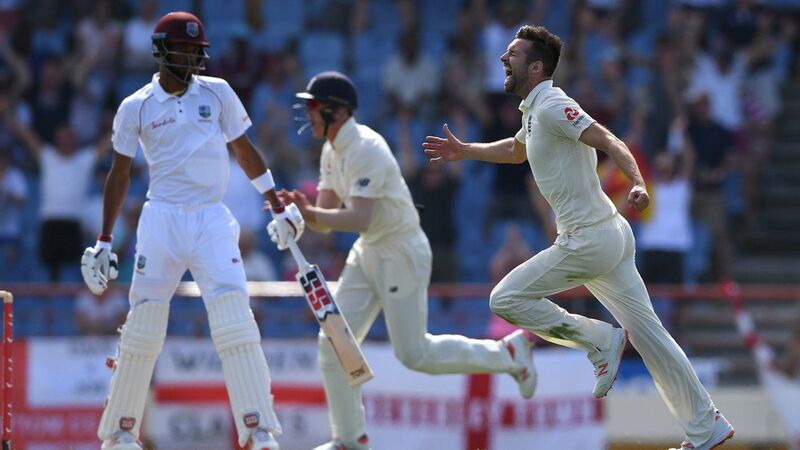 Having bowled England out for a first-innings 277, breaking up the dangerous overnight partnership of Ben Stokes and Jonny Bairstow early to spark another collapse, West Indies are 74 for 5 at tea, trailing by 203 runs, after Wood claimed three wickets and Moeen two to put England on top for the first time this series. Moeen came into the attack in the 13th over after fast bowlers James Anderson and Stuart Broad had become increasingly frustrated by Kraigg Brathwaite and John Campbell, the West Indies opening pair who have put on four half-century partnerships this series and an unbeaten stand of 17 as they chased down a paltry target of 14 runs for a series-clinching victory in the second Test. Ali had enjoyed some success against the pair, having claimed the wickets of both during the first Test in Barbados and Brathwaite again in the first innings in Antigua. Campbell, in particular, looked threatening during the reply in St Lucia, surviving a couple of lbw appeals off Anderson and treating the England spearhead with disdain at times, his 10 runs off Anderson in the seventh over – including a nonchalant six flicked off his hip – a prime example. Anderson’s reaction when he caught Brathwaite in the deep off Ali looked much more resigned than rampant then, on the next delivery, Ali had Campbell out lbw for 41 off 63 balls, ending what had threatened to be a dangerous innings. Wood also took two wickets in as many balls, replacing Anderson in the attack in the 22nd over and showing the pace of caged cheetah let loose. His fourth ball, to Shai Hope, was a 145kph bouncer that sent the batsman ducking to his knees out of harm’s way, while his fifth was 148kph, sent by Hope straight to Rory Burns at gully. The next ball was similar, with Roston Chase edging to Burns again. Wood – a late call-up to the England squad to replace the injured Olly Stone – may have missed the hat-trick, but his next wicket was of enormous value to his team, dismissing another dangerous batsman, Shimron Hetmyer, caught cheaply by Joe Root at second grab in the slips. Some fierce West Indies bowling snuffed out the partnership that had anchored England and steered the tourists to their highest score of the series. Shannon Gabriel made the early breakthrough to dismiss Jos Buttler, who did not add to his overnight score of 67, while Kemar Roach claimed four wickets as England lost 6 for 45 in another mini-collapse.